Professor & Head, Dept. of PG Studies in Dravyaguna Vijnana, Alvas Ayurvedic Medical College, Moodbidri, India. College of Pharmacy, Jazan University, Kingdom of Saudi Arabia. Marine Environmental Division, Hydrobiology Lab., National Institute of Oceanography and Fisheries, Anfoushy, Alexandria, Egypt. Sr. Lecturer, Faculty of Medical Sciences, University of the WEST INDIES, Cave Hill Campus, West Indies. Assistant Professor, Yadavrao Tasgaonkar College of Pharmacy, Bhivpuri, Karjat, India. Project Manager-R & D, Inventia Health Care Pvt. Ltd., India. Principal, NCRD's Institute of Pharmacy, India. Asst. Professor & HOD, Dept. of Pharmacognosy & Phytochemistry, Loknete Dr. J. D. Pawar College of Pharmacy, India. Asst. Professor & HOD, Ideal College of Pharmacy, Kalyan, India. Assistant Professor, Bharathi Vidyapeeths College of Pharmacy, Navi Mumbai, India. Scientist II, S. Zhaveri Pharmakem Ltd., India. Faculty of Pharmacy, Gomal University, Pakistan. AU College of Pharmaceutical Sciences, Andhra University, Visakhapatnam-530003, India. Dean and Director Veerayatan Institute of Pharmacy, Jakhaniya, Bhuj Mandvi road, Kutch, Gujarat-370460, India. Assistant Professor, Dr. L.H.Hiranandani College of Pharmacy, India. Head, Dept. of chemistry, Dr Rafiq zakaria college for Women, Aurangabad (MS) 431001, India. [In-charge, Post graduate and research center, Maulana Azad College, Aurangabad, India. Assistant Professor and Head, Department of Biotechnology, IDSG Government College,Chikmagalur -577102,Karnataka, India. Asst.Professor, Department of Pharmacology, Visveswarapura Institute of Pharmaceutical Sciences, Banashankari II Stage, Bangalore-560070, India. Senior Research Scientist, Ranbaxy Laboratories Limited; Gurgaon-122015, India. Dhamangaon Road , Yavatmal ( M.S )-445001, India. Ex Pro vice chancellor Singhania University Rajasthan,304 Neel Gagan Apartment Anupam Nagar Extension University Road , Gwalior M.P, India. Assistant Professor & Head Dept. of Pharmaceutics, Dayanand College of Pharmacy, Barshi Road,Latur-413531, India. Professor/Principal Scientist & Head, Department of Pharmacology & Toxicology, College of Veterinary Science & Animal Husbandry, Rewa (Nanaji Deshmukh Veterinary Science University, Jabalpur), M.P., India. Birla Institute of Technology,Mesra,Ranchi-835215, India. A/P: Sangamner S.K., Tal: Sangamner, Dist: Ahmednagar (MS), Pin-422608, India. Piramal Healthcare Limited, Mirrakashetty mall,Ramanthapur, Hyderabad-500013, India. M.S.Ramaiah College of Pharmacy, MSRIT Post, Bangalore -560054, India. Head of the Department, Modern Institute of Pharmaceutical sciences,RGPV Gram Alwasa, Behind Rewti range, Sanwer road, Indore, India. Asst. 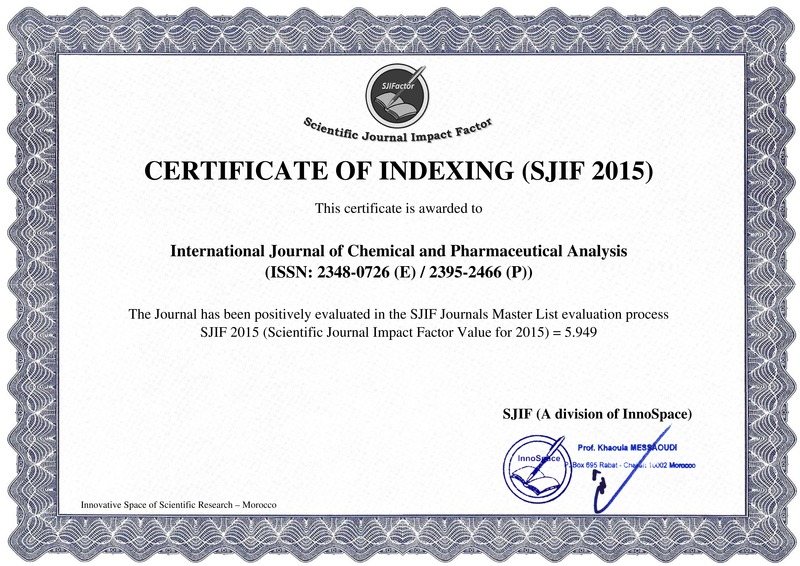 Professor, Srikrupa Institute Of Pharmaceutical Sciences, Velkatta Kondapak Medak A.P-502277, India. Head, Dept. of Pharmaceutics modern College of pharmacy(ladies), Moshi, Pune, India. Associate Professor S.D. College of Pharmacy & Vocational Studies Muzaffarnafar U.P. India. Assistant Professor, Vivekanand Education Society's College of Pharmacy, Hashu Advani Memorial Complex, Collector Colony, Chembur (E). Pin code. 4000074, India. Assistant Professor, Vaish Institute of Pharmaceutical, Education and Research, Rohtak, India. Priyadarshini J.L College of Pharmacy, Nagpur, India. Associate Professor, Shri Vaishnav Institute of Technology & Science (SVITS), Indore, India. Assistant Professor, Vaish institute of pharmaceutical education and research, Rohtak, India. Lecturer and NSS Programme Officer, Institute of Pharmacy , GITAM University, Gandhi Nagar, Rushikonda, Visakhapatnam-530 045, Andhra Pradesh, India. Professor&Principal, Sree Dattha Institute of Pharmacy,Sheriguda,Ibrahimpatnam,R.R.Dt,Hyderabad-501510, Andra Pradesh,India. Asst. Professor, Dr. L.H.Hiranandani College of Pharmacy, Ulhasnagar, Maharashtra, India. Dr. Biswa Mohan Sahoo HOD & Associate Professor, Department of Pharmaceutical Chemistry, Vikas College of Pharmacy, Andhra Pradesh, India. Dr. Sidharth Mehan Associate Professor, Department of Pharmacology, Rajendra Institute of Technology and Science (RITS), Sirsa, Haryana , India.